Clive Walker has a deserved reputation for being one of Africa’s conservation champions, a prolific writer, talented wildlife artist, and one of those rare public speakers who never fails to captivate audiences of all age groups with his passion and enthusiasm, as I have witnessed on many occasions. 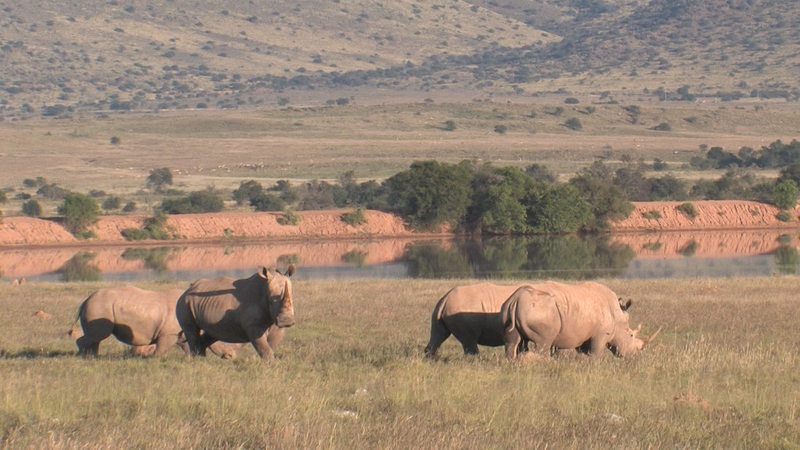 In writing The Rhino’s Last Stand he has teamed up with his son Anton to address a highly controversial question that unfortunately is polarising environmental NGOs and their donors, namely what should be done to secure a sustainable future for the five species of rhinos? I have no doubt that many people will be looking forward to what they have to say, and I was most encouraged to read the clear and unambiguous arguments they have presented in favour of a legal trade in rhino horn, which I need not repeat here. Too many opposing this option bring nothing new to the debate. A regurgitation of their ossified proposals which have clearly failed, is regrettably often accompanied by a shrillness and stridency from those who are the least willing to compromise, understandably sowing confusion in the minds of donors who genuinely want to help but are looking for guidance on what to do. The donor’s dilemma on which rhino project to support is exacerbated by the vagueness of some of the appeals, and an unacceptable paucity of information on the results of the funding of these appeals to ‘save the rhino’. The more reputable NGOs listed by the Walkers are far more circumspect in their articulation of needs and priorities for rhino conservation, recognising that there is no one ‘silver bullet’ to halt poaching, and presenting regular audited financial statements and progress reports on what has been achieved. What is long overdue is a careful and thorough investigation of the results of how the millions of dollars for rhinos raised by the dubious practitioners have been spent. We should not be surprised that the often brutal killing of charismatic species such as elephants and rhinos attract a disproportionate amount of attention and resources[i]. I have used the word ‘disproportionate’ for the very good reason that this fixation on a very small number of species diverts funding from what I believe should be much higher priorities, many of which are directly and indirectly strongly influenced by the high rates of human population growth and its environmental and social impacts, linked to increasing poverty, declining food security, and unemployment. The latest population projections from the United Nations Population Division include the very worrying prediction that more than half of the expected global population growth between now and 2100 will occur in Africa, with the present population of 1.26 billion estimated to increase to 4.47 billion by the end of this century[ii]. Today, 41% of the African population is under the age of 15. Rapid population growth is typically associated with a large number of poorly educated young men with few job opportunities, a recipe for violence, conflict, and an increasing number turning to wildlife crime. The concentration of population growth in the poorest countries will make it harder for those governments to eradicate poverty, and allocate funds for environmental conservation activities, and top of my list of concerns must be the unprecedented threats to Africa’s designated Protected Areas (PAs). These should be the crown jewels of the global commitment to biodiversity conservation – vital areas where natural evolutionary and ecological processes can operate with minimal human disturbance – yet they are becoming increasingly isolated from one another, exacerbated by accelerating land transformation in surrounding areas and an increase in people living in poverty and facing food insecurity. The PAs themselves are directly threatened by human encroachment, hunting for bush-meat and by the illegal wildlife trade. Major shortfalls in financial support for virtually every PA in Africa is impacting on the number and quality of staff, the development and maintenance of roads, buildings, vehicles, and fences, and a serious decline in research activities and basic monitoring[iii]. Furthermore, there is a continued alienation of adjacent rural communities by punitive measures to protect wildlife, which in too many cases make little or no attempt to help these people develop alternative sustainable livelihoods, a real concern that the Walkers have clearly enunciated. Unless local people and their national governments want to conserve wildlife, it will not survive. I would also like to see much more recognition and support being given in addition to this book to the major contributions that are being made to biodiversity conservation in some of the areas outside of the PAs, such as the private land owners (particularly in South Africa), and the communal areas (as demonstrated with the Conservancies in Namibia). Today over 6,500 rhino are found on private reserves in South Africa, 37% of the national herd and more than the rest of Africa combined. John Hume – the world’s largest private rhino owner with 1,533 on his 8,000 hectare ranch – has successfully bred over 1,000 rhinos on his property, and he is the first to appreciate that the has a massive responsibility for the future to help with restocking the PAs that have lost all their animals. He has done this with no help from government and the NGO community. Sadly, he is unjustifiably branded as a greedy land-owner, and does not get the credit and recognition he deserves. Linked to the private sector initiatives is the general lack of awareness of the vital importance of developing a sustainable wildlife economy. The misguided but well-meaning campaigns to eliminate consumptive use of wildlife ignore the realities of poverty in Africa, the extent, impact and costs of mitigating intensifying human-wildlife conflict, and the underfunding of protected areas. Rhino poaching should be viewed as an economic problem. With ongoing consumer demand driving up prices for rhino horn, incentives for illegal activity increase relative to the incentives to protect live rhinos. Where wild rhino populations have survived, this has been due to adequate enforcement spending and rhino-related economic benefit flows to relevant local people, not necessarily because of restrictions on rhino horn trade[iv]. It was the late internationally renowned and highly respected rhino conservationist Ian Player who more than fifty years ago identified the positive role the private sector and private reserves could play in the conservation of the species , through range expansion and sustainable utilization by hunting. He said: ‘To exist in an unnatural world, animals must have a commercial value that can be exploited. Without it, their chances of survival are slim’. I was delighted to see that the book has also been dedicated to the field staff who have the demanding and increasingly dangerous task of protecting what the authors have called the ‘unsung heroes in this battle to keep rhinos alive’. Throughout the continent, the majority of conservation staff do not receive adequate remuneration for the life-threatening situations they face in combatting wildlife crime, and this must change. The Walkers would be the first to recognize the urgent need to promote a far greater awareness that environmental conservation is far more that the ‘charismatic megafauna’, but instead a vitally important prerequisite for building a sustainable future for the whole of Africa, with a renewed emphasis to conserve the full spectrum of biodiversity, a message actively promoted today at the Lapalala Wilderness School which Clive Walker founded over 30 years ago. Recent surveys have documented disturbing population declines and even local extinctions of select pollinator species. For example, bees pollinate human food worldwide valued at more than $350 billion[v], and food security is already being severely compromised by decimation of populations of these and other pollinators. Of course rhinos need all the support they can get in this last stand, as Clive and Anton have portrayed with adroitness and passion, but so do thousands of other species and the ecosystems in which they live. Perhaps new words are needed in the soup of the rhino conservation vocabulary, not just for the sake of novelty, but to stimulate and encourage the often jaded palate of the general public to embrace rhinos not just as charismatic species in their own right, but as environmental conservation ambassadors, inspiring awareness of nature’s extraordinary celebration of biodiversity, and hopefully bringing together a divided conservation paradigm into a united and harmonious ensemble. [i]Krause, M. & Robinson, K. (2017). Charismatic Species and Beyond: How Cultural Schemas and Organisational Routines Shape Conservation. Conservation and Society 15(3): 71-79. [ii]United Nations, Department of Economic and Social Affairs, Population Division (2017). World Population Prospects: The 2017 Revision, Key Findings and Advance Tables.Working Paper No. ESA/P/WP/248. [iii]Watson, J.E.M., Dudley, N., Segan, D.B. & Hockings, M. (2014). The performance and potential of protected areas. Nature515: 67–73.